While this reader is not normally a fan of the fluffy contemporary romance per se, there are exceptions to every rule. Vicky Loebel happens to be one of those PNR writers I had read previously but never in this genre. 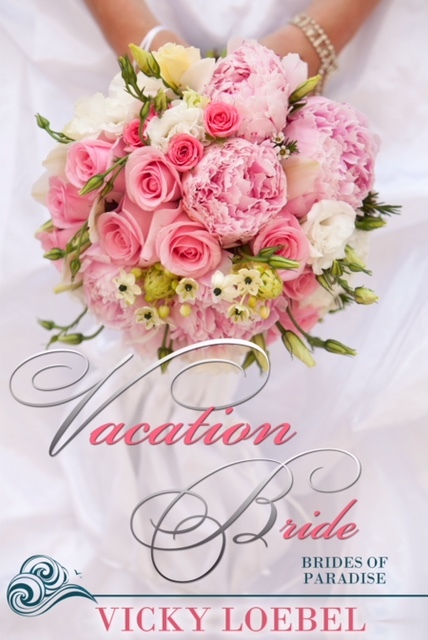 I like her writing style, characters and the premise of Vacation Brides intrigued me. Vacation Brides, Brides of Paradise Book1, catches the reader quickly and keeps them hooked with the slightly saccharine kindness of Anna, the well meaning swim instructor who takes on the internet game show matching her with a billionaire and pitting her against a dozen competitors for him - all to win him a trip to the Carribean to recover from his heart surgery. However, the Bridezillas on the show are so abhorrent, you really start to feel for this girl and root for her to succeed with Chris the island handy man....or is he? A series of crazy trials, lots of secrets, pent up feelings and a wedding - the story maintain pace, interest and the narration is fabulous. Plunk this guilty little indulgence on your TBR pile or gobble it up this weekend, it's cold outside and we can all use a mental vacation to someplace warm and sunny! I give Vacation Bride a cool 4 chocolate dipped strawberries - well worth the read, enjoy yourself, I promise you will. I received this audiobook as part of my participation in a blog tour with Audiobookworm Promotions. The tour is being sponsored by Vicky Loebel. The gifting of this audiobook did not affect my opinion of it. Turquoise water :) I took a lot of inspiration from research into the Caribbean and the US Virgin Islands -- gazing longingly through webcams, watching Caribbean shows on cable TV. My secret hope is to inspire a lot of future tropical vacations. Well, let’s see, there was the megayacht cruise to the US Virgin Islands...oh wait...that was a dream. In real life, we threw a terrific Facebook launch party with games, gift cards, and tropical-themed prizes. It was a hoot!